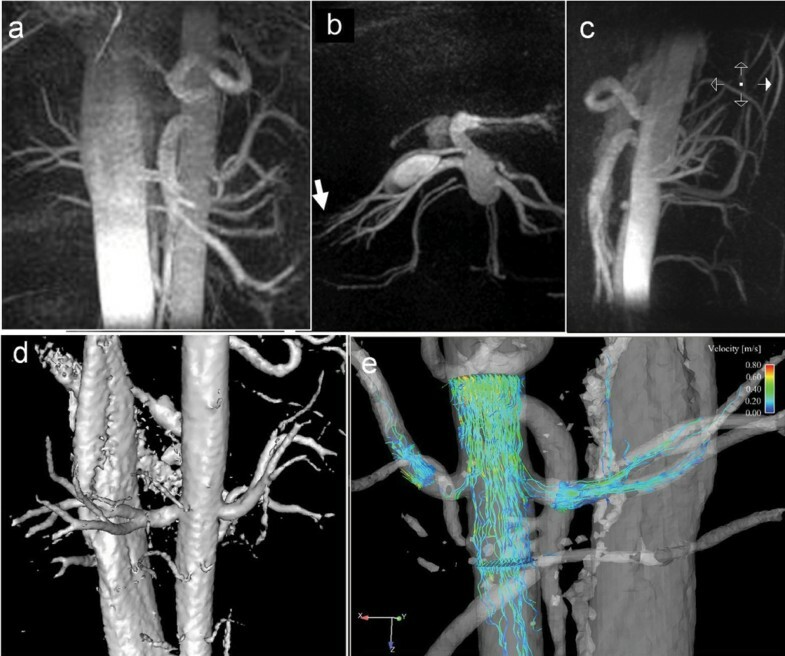 In order to provide both anatomical and functional information for a vascular territory of interest, we have developed phase-contrast vastly unsampled projection reconstruction (PC VIPR), a method that allows for volumetric 3D CINE flow imaging with high spatial and temporal resolution and large coverage in a reasonable scan time . The use of the 3D radially undersampled VIPR trajectory overcomes several of the limitations of standard PC MR acquisitions, most importantly the lengthy scan time required to achieve adequate spatial resolution, also associated with artifacts from intravoxel dephasing. This approach has been shown to generate high quality angiograms and 3D cine velocity vector fields that can be used to derive additional hemodynamic parameters including transstenotic pressure gradients and wall shear stress [3–5]. Since no contrast agent is required, this technique is of particular interest with light of increasing concerns for nephrogenic systemic fibrosis (NSF, formerly also referred to as nephrogenic fibrosing dermopathy/NFD)  which has been associated with gadolinium based contrasts agents in patients with diminished renal function and pro-inflammatory conditions . To reliably achieve high quality images, several correction schemes were applied to account for the effects of T1-saturation, trajectory errors, motion, and aliasing associated with undersampling. We have developed a dual-echo PC VIPR acquisition with a PILS reconstruction and respiratory gating on our 3 T clinical system (GE Healthcare) with a 62.5 kHz receiver bandwidth, a VENC of 60 cm/s that achieves a 1.0 mm isotropic spatial resolution in approximately 10 min scan time with 50% respiratory gating efficiency. Respiratory gating was performed with an adaptive gating scheme based on bellows readings. The technique was evaluated in 9 consecutive volunteers of whom 5 also received a contrast-enhanced MRA for comparison. PC VIPR produced high quality images for all 9 subjects. The angiograms obtained from the average flow data for a representative case are shown in Figure 1. Note the large coverage and isotropic spatial resolution. In addition to the average flow data (a-d), individual cardiac frames may be reconstructed with a reduced SNR and visualized with advanced software (e). 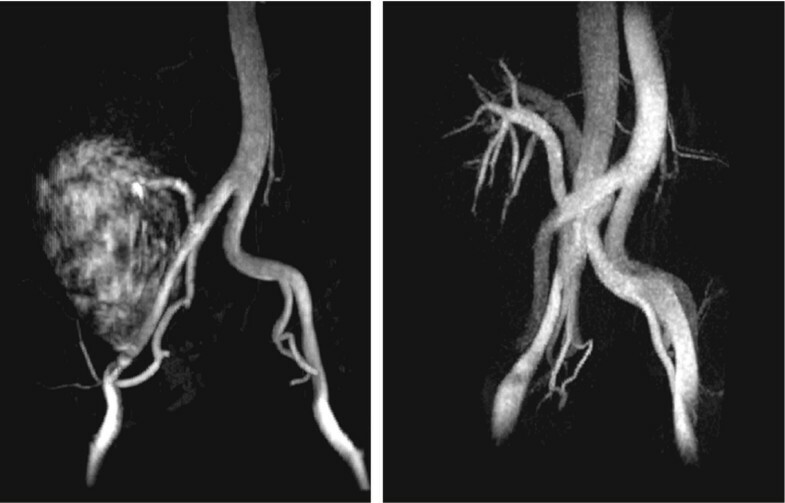 While the veins are also visible in the PC VIPR data, smaller segmental arteries can be visualized because of the inherent complete subtraction of signal in the kidneys as demonstrated in Figure 2. The presence of high venous signal is not problematic because of the high spatial resolution, allowing the vessels to be clearly distinguished from one another. Average flow data of a renal PC VIPR exam displayed as coronal (a), axial (b) and saggital (c) MIP images in a volume rendered display (d). The velocity vectors in 4 selected planes and calculated streamlines are displayed in a prototype visualization based on Ensight (CEI Inc., Apex, NC) in (e). This subject has bilateral accessory renal arteries supplying the lower pole to each kidney with a total of 4 renal vessels. MIP images from a subject with a renal transplant obtained with our clinical CE-MRA protocol during a breathhold (a) and with the respiratory gated PC VIPR sequence (b). In conclusion, the respiratory gated PC VIPR method provides high spatial resolution and high quality renal artery angiograms. Compared to other 3D cine flow measurements, the small voxel volumes minimize intra-voxel dephasing effects. This approach requires no contrast and, therefore, PC VIPR provides an excellent alternative for patients that are excluded from CE-MRA otherwise. In animal studies, we have previously demonstrated that this technique can be used to measure trans-stenotic pressure gradients non-invasively in carotid and iliac arteries with good agreement to endovascular measurements [3–5]. This combination of anatomical and functional information has the potential to improve the non-invasive evaluation of hemodynamic significant renal artery stenosis and spare patients avoidable invasive procedures. Further evaluation in a broad patient base is currently under way. Radially undersampled 3D phase contrast imaging with respiratory and cardiac gating was used to acquire high spatial resolution, CINE velocity fields and angiograms of the abdominal vasculature without the need for a contrast agent.